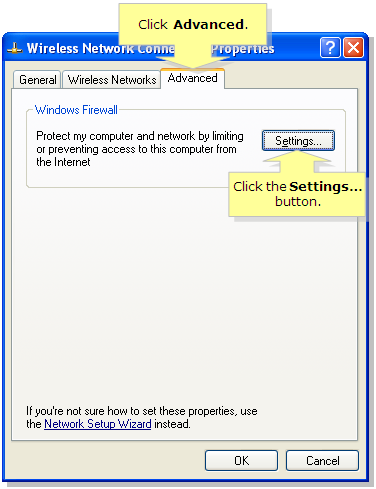 Windows XP has a built-in firewall that provides security by limiting or preventing access to your computer from the Internet. Sometimes software firewalls, like the one included with Windows, conflicts with the built-in hardware firewall of the Linksys router. In such cases you have to disable the built-in firewall. If you’re using a third-party firewall, refer to the manufacturer’s website for instructions on how to disable it. Click Start, then select Control Panel. 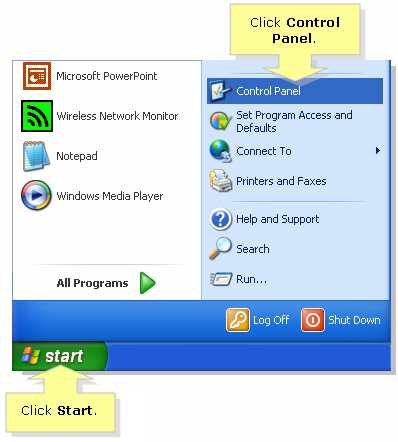 When the Control Panel window appears, double-click Network Connections. 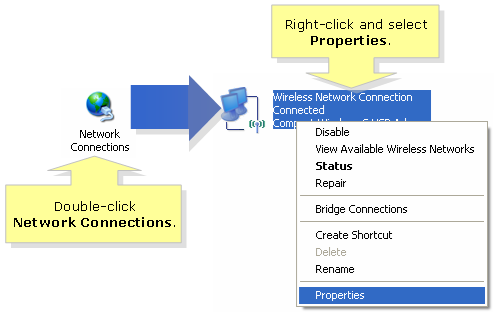 Right-click Local Area Connection or Wireless Network Connection (depending on which connection you want to configure) and select Properties. Click the Advanced tab, then click the Settings… button. 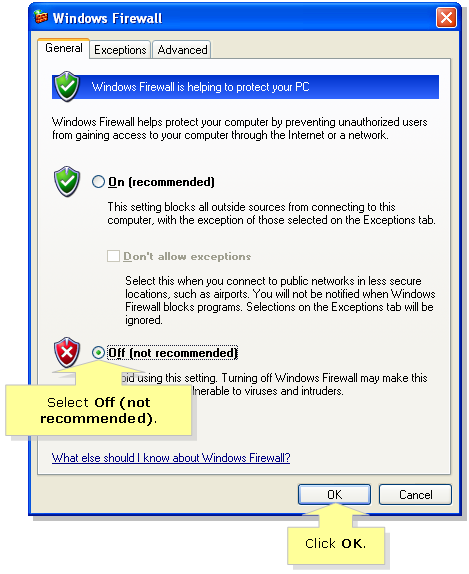 Under Windows Firewall, select Off (not recommended) then click OK.
To check your connectivity, try to ping your Linksys router. For instructions, click here. QUICK TIP: A ping test helps determine your computer's connection to the Linksys router. NOTE: If the computer is unable to ping your Linksys router, it’s possible that your router’s IP address has been changed or your computer was not able to establish a connection with the router. For instructions on how to check your router’s IP address, click here.